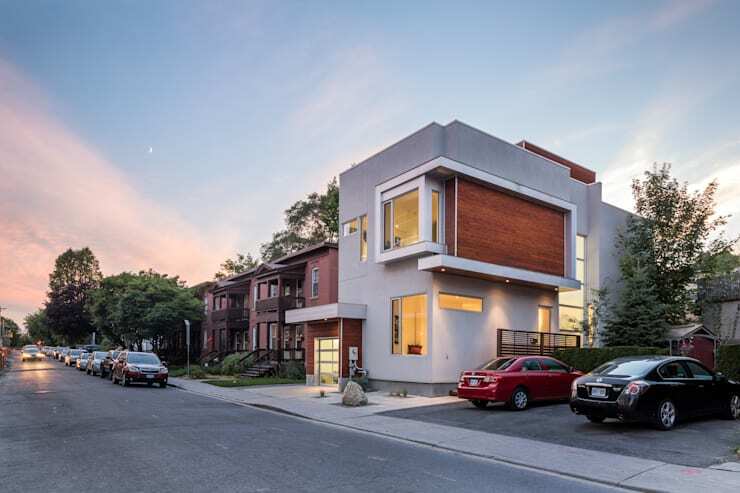 Today we’ll tour Fold Place in Ottawa’s vibrant Glebe neighborhood. It’s a home that is committed to urban casual style. Inside, we’ll find open and flowing spaces that make the modest dimensions of the house seem larger. The interiors are simply and elegantly designed to create the perfect retreat for urbanites to recharge. Let’s start our tour now and see what makes this home one of the most stylish on the block. The home is built on an irregularly shaped site. 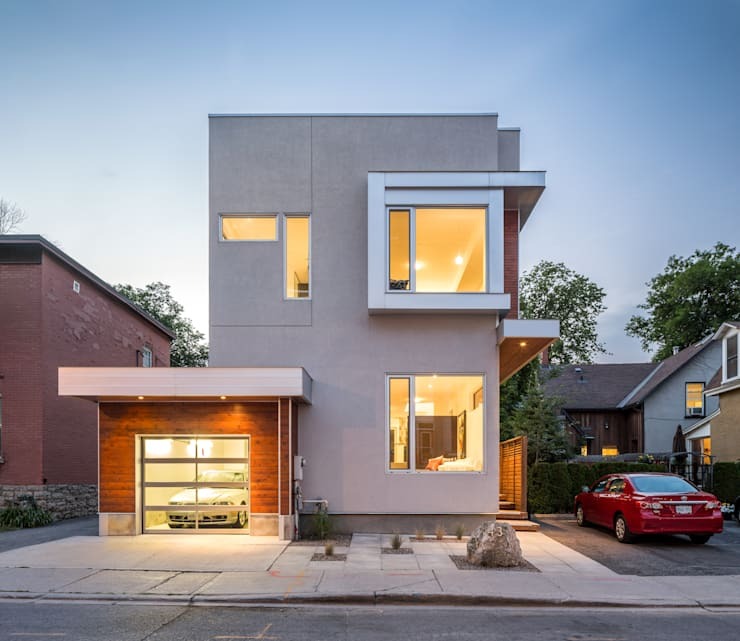 Architects managed to maximize the potential of the narrow lot by creating a voluminous home. Its street profile is strikingly modern with a dynamic shape. Cool grey pairs with rich paneled wood on the exterior to create a sleek look that’s unmistakably urban. The home has large windows throughout and even a glass-paneled garage door! The reiterated rectangle shapes on the front of the home are a fun touch. Even though the windows are large, the home maintains its privacy and seems reserved. The front door is tucked away from the street, giving the home a more secluded quality. Check out the simple landscaping in front of the house! A smattering of grasses and rocks creates a low-maintenance yard in front the home. The front entrance gives a great impression of the home. The space plays with light and texture. Matte tiles and a glossy hardwood floor help demarcate the entrance way from the rest of the house. We love the gravelly indoor rock garden next to the door. 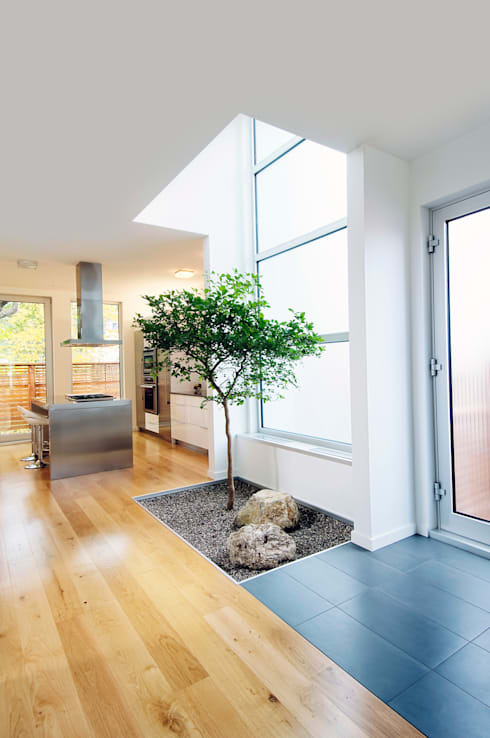 It’s an unexpected touch of nature in this urban home. This stylish home has richly detailed design. 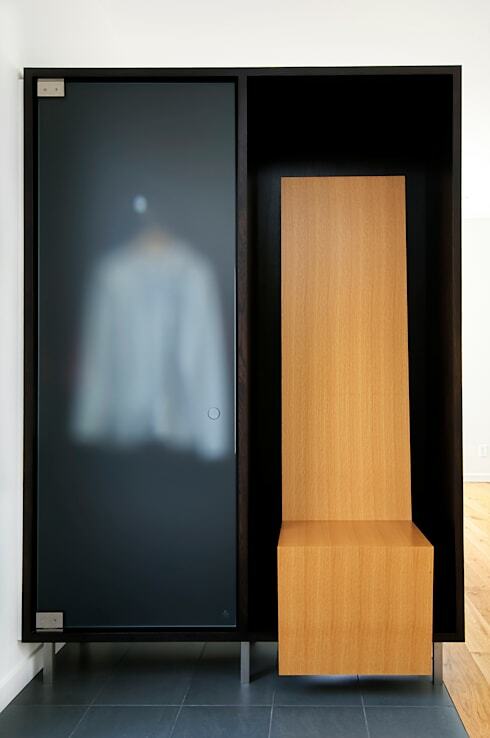 We love the look of this bench and wardrobe combination by the door. It’s a sophisticated response to the need for a mud room. The furniture is a blend of Japanese and Scandinavian design that makes this home fit for urbanites. The double height windows gather light inside the home. They make the entrance bright and cheerful. Opaque glass from the window and on the front door creates privacy and invites light inside. A crisp palette combined with plenty of natural light gives any home instant chicness. What the kitchen lacks in counter space it makes up for in features. The kitchen is fully loaded with double ovens and fridges. The center island has a gas range stove. It acts as both kitchen counter and breakfast bar. White, black, and stainless steel touches creates cohesive style in the room. 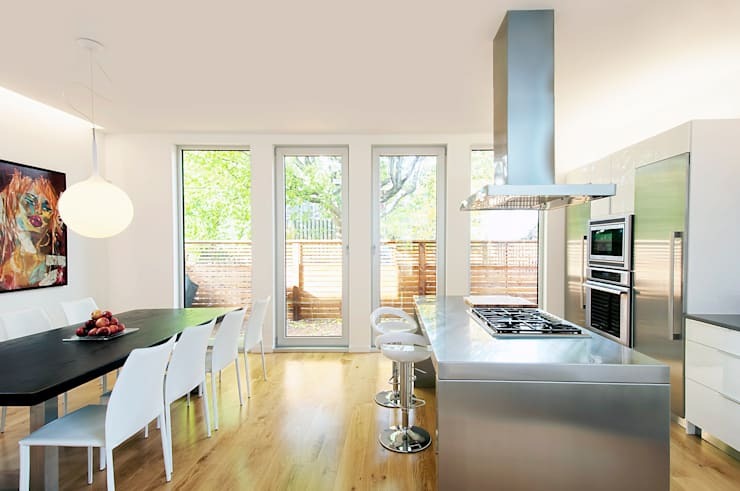 The high polish of the floors and the stainless steel bounce light around the room. Massive windows along the edge of the kitchen and dining space open up to a private outdoor terrace. We love the sleek and modern look of the kitchen island. 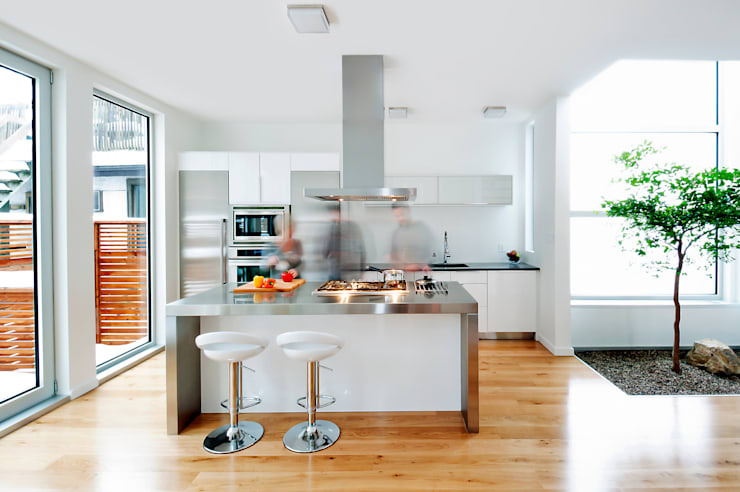 The stainless steel top gives the kitchen a slight industrial edge. 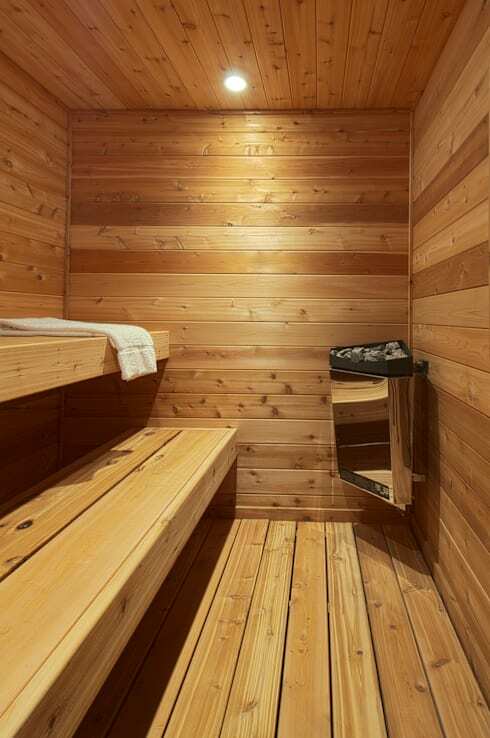 The home has its own wood sauna where you can go to sweat out all the tension from the day. Spa bathrooms are a welcome design because they elevate the everyday into the exceptional. We’d love to spend a morning here! Beats a cup of coffee for that morning motivation. Thanks for taking a tour with us of this lovely Ottawa home! It manages to pack serious style into its small square footage. 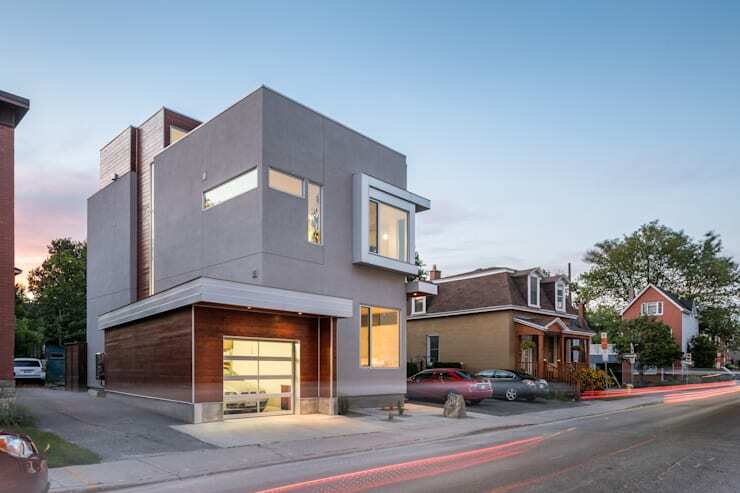 One of the more stylish homes on the block, it exudes urban casual style. Need more home inspiration? Check out our feature on a home where Zen meets Ultra Modern. What did you think of the spa bathroom?